Having never been to North Dakota myself, or really knowing anything about it, I had a little research to do. Turns out, North Dakota may be America’s best kept secret – and they’d like to keep it that way. “North Dakota Nice” is actually a thing – a whole state full of honest, kind, helpful people. With the amount of annual snowfall they put up with, this is really saying something. In the Northeast we complain if there’s more than six inches but call the winter a giant disappointment if it holds out all together, whereas in North Dakota, ice fishing has become a pastime everyone has tried at least once. In North Dakota’s small towns, folks rarely lock their doors and can often be seen heading into the store, keys still in the ignition (everyone in New Jersey is packing their things and heading west). They hunt, they fish, they go to the local ice cream joint (when the snow finally melts and it re-opens), and they treat each other well. Sounds like a great place to be. Below you’ll see the recipe for a rather genteel, high-class libation, suitably dubbed “Everything’s Coming up Rosé” because if you hail from North Dakota, this might just be how you feel. Combine wine, tea, Lillet, lemon juice, simple syrup, and Aperol in a pitcher. Divide between 4–6 ice-filled glasses and top each with 1–2 oz. sparkling wine. 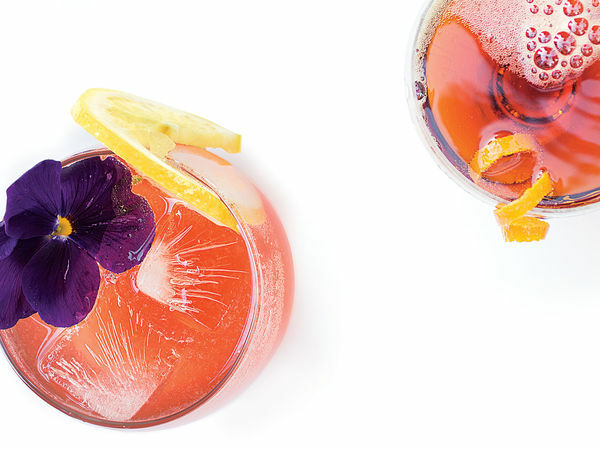 Garnish with lemon wheels, edible flowers, and grapefruit slices.